Dates are a sweet treat that many of us love to enjoy. They can be easily mixed into granola bars, baking goods, or atop salads. Their rich nutritional profile is filled with minerals, vitamins, and healthy oils. While also helping us build muscles and support a strong immune system. So since these little fruits are such an excellent source of nutrition for us, the same can be said for our pets, right? Unfortunately, what is good for us is not always good for our pets. Take garlic for example, it takes a lot more than good nutrition to make up an excellent pet snack. You need to consider the pet, their natural diet, and how sensitive their stomach is. Only then can you decide if any fruit, vegetable, or even meat is ok for your furry friend to consume. Can you give your cat dates? Answer: Yes, but your cat should avoid them. Typically cats can eat dates without the need to visit the vet, but it is a much better idea to avoid tossing one to your cat in the first place. 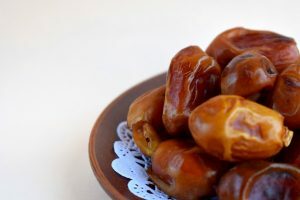 There are a number of potential issues associated with cats eating dates, plus you will also find there is really no benefit to a cat enjoying a date. This is because cats lack sweet receptors. So even though dates may be a healthy yet candy-like item for you, to cats it is just another piece of food to munch on. For this reason, it is a much better idea to give them a snack or treat designed with cats in mind. Yes, dates have health benefits but you can find those same benefits in other food items that are not nearly as risky as the date. Earlier we mentioned quite a few health benefits to humans eating dates, but when it comes to cats the consequences outweigh the benefits. This is why we advise you keep dates away from your cat, even on the rare occasion it is just not beneficial. The main reason you should not give your cat dates is because it causes a laxative effect. Simply by feeding your small cat a single date can produce diarrhea, digestive issues, and an upset tummy. Even if you find your cat is having constipation issues, it is best to avoid dates since it could lead to even further digestion problems. If your cat does consume a date, be cautious of their stools and mood for the next few days. Some cats may have a mild reaction like loose stools and other will need to make a visit to the vet. When you think about the size of the cat and what their diet should consist of, they only need about 200 – 250 calories per day. You will certainly go over this amount if you regularly feed your cat dates, due to their high-calorie content. Dates pose a choking hazard to your cat. Inside a date, you will find a large pit. If your cat consumes the date too quickly, they can easily choke. Lastly, dates can harm your cat’s dental health. This sugary snack can get caught in their teeth and promote tooth decay. This is an unfortunate waste especially when your furry feline cannot even enjoy the sweet taste! Even though you will find a bit of variation among veterinarians and cat experts on what makes a healthy cat diet, the majority agree dates should be off the menu for cats. If you cat gets ahold of a date or two, it may not be a reason to visit your vet at first. Although it is still a good idea to watch your pet for the next 24 hours or so to make sure it does not cause too much of a disruption with their digestion. Dates are not as bad as some other items that are strongly restricted from cats. For example, grapes, onions, and chocolate are all a no-go. We mentioned that cats lack sweet receptors and therefore, will not be able to enjoy the taste of dates as much as we do. This carries over to other treats as well. If you are looking to reward your cat or even celebrate their birthday, they will be much happier with a bit of lamb or beef in moderation. Ultimately, cats are typically going to show an interest in whatever snack you are enjoying. This does not mean it is always a good idea to share. If your cat has consumed a date, it should not cause alarm but be sure to watch him closely for the next 24 hours. Afterwards it is best to make sure your friend does not consume any more dates since there are plenty of potential consequences and few benefits. Can Rabbits Eat Beans? Can Dogs Drink Cold Water?